The Semantic Web represents a broad range of ideas and technologies that attempt to bring meaning to the vast amount of information available via the Web. The intention is to provide information in a structured form so that it can be processed automatically by machines. The combination of structured data and inferencing can yield much information not explicitly stated. The aim of the Semantic Web is to solve the most problematic issues that come with the growth of the non-semantic (HTML-based or similar) Web that results in a high level of human effort for finding, retrieving and exploiting information. For example, contemporary search engines are extremely fast, but tend to be very poor at producing relevant results. Of the thousands of matches typically returned, only a few point to truly relevant content and some of this content may be buried deep within the identified pages. Such issues dramatically reduce the value of the information discovered as well as the ability to automate the consumption of such data. Other problems related to classification and generalisation of identifiers further confuse the landscape. The Semantic Web solves such issues by adopting unique identifiers for concepts and the relationships between them. These identifiers, called Universal Resource Identifiers (URIs) (a “resource” is any ‘thing’ or ‘concept’) are similar to Web page URLs, but do not necessarily identify documents from the Web. Their sole purpose is to uniquely identify objects or concepts and the relationships between them. The use of URIs removes much of the ambiguity from information, but the Semantic Web goes further by allowing concepts to be associated with hierarchies of classifications, thus making it possible to infer new information based on an individual’s classification and relationship to other concepts. This is achieved by making use of ontologies – hierarchical structures of concepts – to classify individual concepts. The World-Wide Web has grown rapidly and contains huge amounts of information that cannot be interpreted by machines. Machines cannot understand meaning, therefore they cannot understand Web content. For this reason, most attempts to retrieve some useful pieces of information from the Web require a high degree of user involvement – manually retrieving information from multiple sources (different Web pages), ‘digging’ through multiple search engine results (where useful pieces of data are often buried many pages deep), comparing differently structured result sets (most of them incomplete), and so on. There must be a unified system for conveying and interpreting meaning that all automated search agents and data storage applications should use. One approach for attaching semantic information to Web content is to embed the necessary machine-processable information through the use of special meta-descriptors (meta-tagging) in addition to the existing meta-tags that mainly concern the layout. The Resource Description Framework (RDF) developed by the World Wide Web Consortium (W3C) makes possible the automated semantic processing of information, by structuring information using individual statements that consist of: Subject, Predicate, Object. Although frequently referred to as a ‘language’, RDF is mainly a data model. It is based on the idea that the things being described have properties, which have values, and that resources can be described by making statements. RDF prescribes how to make statements about resources, in particular, Web resources, in the form of subject-predicate-object expressions. The ‘John Doe’ example above is precisely this kind of statement. The statements are also referred to as triples, because they always have the subject-predicate-object structure. The basic RDF components include statements, Uniform Resource Identifiers, properties, blank nodes and literals. They are discussed in the topics that follow. A unique Uniform Resource Identifier (URI) is assigned to any resource or thing that needs to be described. Resources can be authors, books, publishers, places, people, hotels, goods, articles, search queries, and so on. In the Semantic Web, every resource has a URI. A URI can be a URL or some other kind of unique identifier. Unlike URLs, URIs do not necessarily enable access to the resource they describe, i.e, in most cases they do not represent actual web pages. For example, the string http://www.johndoesite.com/aboutme.htm, if used as a URL (Web link) is expected to take us to a Web page of the site providing information about the site owner, the person John Doe. The same string can however be used simply to identify that person on the Web (URI) irrespective of whether such a page exists or not. Thus URI schemes can be used not only for Web locations, but also for such diverse objects as telephone numbers, ISBN numbers, and geographic locations. In general, we assume that a URI is the identifier of a resource and can be used as either the subject or the object of a statement. Once the subject is assigned a URI, it can be treated as a resource and further statements can be made about it. This idea of using URIs to identify ‘things’ and the relations between them is important. This approach goes some way towards a global, unique naming scheme. The use of such a scheme greatly reduces the homonym problem that has plagued distributed data representation in the past. the thing the statement says is the value of this property (who the owner is). the object is the name of the creator, which has the value “John Doe”. the object is http://www.johndoesite.com/aboutme (which may not be an actual web page). Note that in this version of the statement, instead of identifying the creator of the web site by the character string “John Doe”, we used a URI, namely http://www.johndoesite.com/aboutme. An advantage of using a URI is that the identification of the statement’s subject can be more precise, i.e., the creator of the page is neither the character string “John Doe”, nor any of the thousands of other people with that name, but the particular John Doe associated with this URI (whoever created the URI defines the association). Moreover, since there is a URI to refer to John Doe, he is now a full-fledged resource and additional information can be recorded about him simply by adding additional RDF statements with John’s URI as the subject. There are several conventions for writing abbreviated RDF statements, as used in the RDF specifications themselves. This shorthand employs an XML qualified name (or QName) without angle brackets as an abbreviation for a full URI reference. A QName contains a prefix that has been assigned to a namespace URI, followed by a colon, and then a local name. The full URI reference is formed from the QName by appending the local name to the namespace URI assigned to the prefix. So, for example, if the QName prefix foo is assigned to the namespace URI http://example.com/somewhere/, then the QName “foo:bar” is a shorthand for the URI http://example.com/somewhere/bar. In our example, we can define the namespace jds for http://www.johndoesite.com and use the Dublin Core Metadata namespace dc for http://purl.org/dc/elements/1.1/. This kind of graph is known in the artificial intelligence community as a ‘semantic net’. RDF/XML uses the namespace mechanism of XML, but in an expanded way. In XML, namespaces are only used for disambiguation purposes. In RDF/XML, external namespaces are expected to be RDF documents defining resources, which are then used in the importing RDF document. This mechanism allows the reuse of resources by other people who may decide to insert additional features into these resources. The result is the emergence of large, distributed collections of knowledge. Also observe that the rdf:about attribute of the element rdf:Description is equivalent in meaning to that of an ID attribute, but it is often used to suggest that the object about which a statement is made has already been ‘defined’ elsewhere. Strictly speaking, a set of RDF statements together simply forms a large graph, relating things to other things through properties, and there is no such concept as ‘defining’ an object in one place and referring to it elsewhere. Nevertheless, in the serialised XML syntax, it is sometimes useful (if only for human readability) to suggest that one location in the XML serialisation is the ‘defining’ location, while other locations state ‘additional’ properties about an object that has been ‘defined’ elsewhere. Properties are a special kind of resource: they describe relationships between resources, e.g., written by, age, title, and so on. Properties in RDF are also identified by URIs (in most cases, these are actual URLs). Therefore, properties themselves can be used as the subject in other statements, which allows for an expressive ways to describe properties, e.g., by defining property hierarchies. A named graph (NG) is a set of triples named by a URI. This URI can then be used outside or within the graph to refer to it. The ability to name a graph allows separate graphs to be identified out of a large collection of statements and further allows statements to be made about graphs. Named graphs represent an extension of the RDF data model, where quadruples <s,p,o,ng> are used to define statements in an RDF multi-graph. This mechanism allows, e.g., the handling of provenance when multiple RDF graphs are integrated into a single repository. From the perspective of GraphDB, named graphs are important, because comprehensive support for SPARQL requires NG support. While being a universal model that lets users describe resources using their own vocabularies, RDF does not make assumptions about any particular application domain, nor does it define the semantics of any domain. It is up to the user to do so using an RDF Schema (RDFS) vocabulary. RDF Schema is a vocabulary description language for describing properties and classes of RDF resources, with a semantics for generalisation hierarchies of such properties and classes. Be aware of the fact that the RDF Schema is conceptually different from the XML Schema, even though the common term schema suggests similarity. The XML Schema constrains the structure of XML documents, whereas the RDF Schema defines the vocabulary used in RDF data models. Thus, RDFS makes semantic information machine-accessible, in accordance with the Semantic Web vision. RDF Schema is a primitive ontology language. It offers certain modelling primitives with fixed meaning. RDF Schema does not provide a vocabulary of application-specific classes. Instead, it provides the facilities needed to describe such classes and properties, and to indicate which classes and properties are expected to be used together (for example, to say that the property JobTitle will be used in describing a class “Person”). In other words, RDF Schema provides a type system for RDF. The RDF Schema type system is similar in some respects to the type systems of object-oriented programming languages such as Java. For example, RDFS allows resources to be defined as instances of one or more classes. In addition, it allows classes to be organised in a hierarchical fashion. For example, a class Dog might be defined as a subclass of Mammal, which itself is a subclass of Animal, meaning that any resource that is in class Dog is also implicitly in class Animal as well. RDF classes and properties, however, are in some respects very different from programming language types. RDF class and property descriptions do not create a straight-jacket into which information must be forced, but instead provide additional information about the RDF resources they describe. The RDFS facilities are themselves provided in the form of an RDF vocabulary, i.e., as a specialised set of predefined RDF resources with their own special meanings. The resources in the RDFS vocabulary have URIs with the prefix http://www.w3.org/2000/01/rdf-schema# (conventionally associated with the namespace prefix rdfs). Vocabulary descriptions (schemas) written in the RDFS language are legal RDF graphs. Hence, systems processing RDF information that do not understand the additional RDFS vocabulary can still interpret a schema as a legal RDF graph consisting of various resources and properties. However, such a system will be oblivious to the additional built-in meaning of the RDFS terms. To understand these additional meanings, the software that processes RDF information has to be extended to include these language features and to interpret their meanings in the defined way. A class can be thought of as a set of elements. Individual objects that belong to a class are referred to as instances of that class. A class in RDFS corresponds to the generic concept of a type or category similar to the notion of a class in object-oriented programming languages such as Java. RDF classes can be used to represent any category of objects such as web pages, people, document types, databases or abstract concepts. Classes are described using the RDF Schema resources rdfs:Class and rdfs:Resource, and the properties rdf:type and rdfs:subClassOf. The relationship between instances and classes in RDF is defined using rdf:type. An important use of classes is to impose restrictions on what can be stated in an RDF document using the schema. In programming languages, typing is used to prevent incorrect use of objects (resources) and the same is true in RDF imposing a restriction on the objects to which the property can be applied. In logical terms, this is a restriction on the domain of the property. In addition to describing the specific classes of things they want to describe, user communities also need to be able to describe specific properties that characterise these classes of things (such as numberOfBedrooms to describe an apartment). In RDFS, properties are described using the RDF class rdf:Property, and the RDFS properties rdfs:domain, rdfs:range and rdfs:subPropertyOf. RDFS also provides vocabulary for describing how properties and classes are intended to be used together. The most important information of this kind is supplied by using the RDFS properties rdfs:range and rdfs:domain to further describe application-specific properties. These statements indicate that ex:Person is a class, ex:author is a property, and that RDF statements using the ex:author property have instances of ex:Person as objects. These statements indicate that ex:Book is a class, ex:author is a property, and that RDF statements using the ex:author property have instances of ex:Book as subjects. RDFS provides the means to create custom vocabularies. However, it is generally easier and better practice to use an existing vocabulary created by someone else who has already been describing a similar conceptual domain. Such publicly available vocabularies, called ‘shared vocabularies’, are not only cost-efficient to use, but they also promote the shared understanding of the described domains. the predicate dc:creator, when fully expanded into a URI, is an unambiguous reference to the creator attribute in the Dublin Core metadata attribute set, a widely used set of attributes (properties) for describing information of this kind. So this triple is effectively saying that the relationship between the website (identified by http://www.johndoesite.com/) and the creator of the site (a distinct person, identified by http://www.johndoesite.com/aboutme) is exactly the property identified by http://purl.org/dc/elements/1.1/creator. This way, anyone familiar with the Dublin Core vocabulary or those who find out what dc:creator means (say, by looking up its definition on the Web) will know what is meant by this relationship. In addition, this shared understanding based upon using unique URIs for identifying concepts is exactly the requirement for creating computer systems that can automatically process structured information. However, the use of URIs does not solve all identification problems, because different URIs can be created for referring to the same thing. For this reason, it is a good idea to have a preference towards using terms from existing vocabularies (such as the Dublin Core) where possible, rather than making up new terms that might overlap with those of some other vocabulary. Appropriate vocabularies for use in specific application areas are being developed all the time, but even so, the sharing of these vocabularies in a common ‘Web space’ provides the opportunity to identify and deal with any equivalent terminology. An example of a shared vocabulary that is readily available for reuse is The Dublin Core, which is a set of elements (properties) for describing documents (and hence, for recording metadata). The element set was originally developed at the March 1995 Metadata Workshop in Dublin, Ohio, USA. Dublin Core has subsequently been modified on the basis of later Dublin Core Metadata workshops and is currently maintained by the Dublin Core Metadata Initiative. The goal of Dublin Core is to provide a minimal set of descriptive elements that facilitate the description and the automated indexing of document-like networked objects, in a manner similar to a library card catalogue. The Dublin Core metadata set is suitable for use by resource discovery tools on the Internet, such as Web crawlers employed by search engines. In addition, Dublin Core is meant to be sufficiently simple to be understood and used by the wide range of authors and casual publishers of information to the Internet. Dublin Core elements have become widely used in documenting Internet resources (the Dublin Core creator element was used in the earlier examples). The current elements of Dublin Core contain definitions for properties such as title (a name given to a resource), creator (an entity primarily responsible for creating the content of the resource), date (a date associated with an event in the life-cycle of the resource) and type (the nature or genre of the content of the resource). <dc:description>Describes planting and nurturing rose bushes. In general, an ontology formally describes a (usually finite) domain of related concepts (classes of objects) and their relationships. For example, in a company setting, staff members, managers, company products, offices, and departments might be some important concepts. The relationships typically include hierarchies of classes. A hierarchy specifies a class C to be a subclass of another class C' if every object in C is also included in C'. For example, all managers are staff members. specifications of logical relationships between objects (every department must have at least three staff members). Ontologies are important because semantic repositories use ontologies as semantic schemata. This makes automated reasoning about the data possible (and easy to implement) since the most essential relationships between the concepts are built into the ontology. Formal knowledge representation (KR) is about building models. The typical modelling paradigm is mathematical logic, but there are also other approaches, rooted in the information and library science. KR is a very broad term; here we only refer to the mainstream meaning of the world (of a particular state of affairs, situation, domain or problem), which allow for automated reasoning and interpretation. Such models consist of ontologies defined in a formal language. Ontologies can be used to provide formal semantics (i.e., machine-interpretable meaning) to any sort of information: databases, catalogues, documents, Web pages, etc. Ontologies can be used as semantic frameworks: the association of information with ontologies makes such information much more amenable to machine processing and interpretation. This is because ontologies are described using logical formalisms, such as OWL, which allow automatic inferencing over these ontologies and datasets that use them, i.e., as a vocabulary. An important role of ontologies is to serve as schemata or ‘intelligent’ views over information resources. This is also the role of ontologies in the Semantic Web. Thus, they can be used for indexing, querying, and reference purposes over non-ontological datasets and systems such as databases, document and catalogue management systems. Because ontological languages have formal semantics, ontologies allow a wider interpretation of data, i.e., inference of facts, which are not explicitly stated. In this way, they can improve the interoperability and the efficiency of using arbitrary datasets. An ontology O can be defined as comprising the 4-tuple. A is a set of axioms (e.g., if a product has a price greater than €200, then shipping is free). Ontologies can be classified as light-weight or heavy-weight according to the complexity of the KR language and the extent to which it is used. Light-weight ontologies allow for more efficient and scalable reasoning, but do not possess the highly predictive (or restrictive) power of more powerful KR languages. Ontologies can be further differentiated according to the sort of conceptualisation that they formalise: upper-level ontologies model general knowledge, while domain and application ontologies represent knowledge about a specific domain (e.g., medicine or sport) or a type of application, e.g., knowledge management systems. Lexical ontologies: lexicons with formal semantics that define lexical concepts. We use ‘lexical concept’ here as some kind of a formal representation of the meaning of a word or a phrase. In Wordnet, for example, lexical concepts are modelled as synsets (synonym sets), while word-sense is the relation between a word and a synset, word-senses and terms. These can be considered as semantic thesauri or dictionaries. The concepts defined in such ontologies are not instantiated, rather they are directly used for reference, e.g., for annotation of the corresponding terms in text. WordNet is the most popular general purpose (i.e., upper-level) lexical ontology. Knowledge base (KB) is a broader term than ontology. Similar to an ontology, a KB is represented in a KR formalism, which allows automatic inference. It could include multiple axioms, definitions, rules, facts, statements, and any other primitives. In contrast to ontologies, however, KBs are not intended to represent a shared or consensual conceptualisation. Thus, ontologies are a specific sort of a KB. Many KBs can be split into ontology and instance data parts, in a way analogous to the splitting of schemata and concrete data in databases. PROTON is a light-weight upper-level schema-ontology developed in the scope of the SEKT project, which we will use for ontology-related examples in this section. PROTON is encoded in OWL Lite and defines about 542 entity classes and 183 properties, providing good coverage of named entity types and concrete domains, i.e., modelling of concepts such as people, organisations, locations, numbers, dates, addresses, etc. 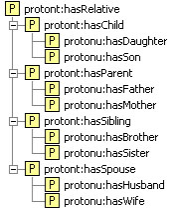 A snapshot of the PROTON class hierarchy is shown below. The topics that follow take a closer look at the logic that underlies the retrieval and manipulation of semantic data and the kind of programming that supports it. a reasoner will interpret the IF..THEN statements as rules and determine that C is indeed inferred from the KB. This use of rules in logic programming has led to ‘rule-based reasoning’ and ‘logic programming’ becoming synonymous, although this is not strictly the case. In LP, there are rules of logical inference that allow new (implicit) statements to be inferred from other (explicit) statements, with the guarantee that if the explicit statements are true, so are the implicit statements. Because these rules of inference can be expressed in purely symbolic terms, applying them is the kind of symbol manipulation that can be carried out by a computer. This is what happens when a computer executes a logical program: it uses the rules of inference to derive new statements from the ones given in the program, until it finds one that expresses the solution to the problem that has been formulated. If the statements in the program are true, then so are the statements that the machine derives from them, and the answers it gives will be correct. The program must contain enough statements to allow solutions to be derived for all the problems that are of interest. There must also be a reasonable time frame for the entire inference process. To this end, much research has been carried out to determine the complexity classes of various logical formalisms and reasoning strategies. Generally speaking, to reason with Web-scale quantities of data requires a low-complexity approach. A tractable solution is one whose algorithm requires finite time and space to complete. It is possible to trace the proof that leads to a logical consequence. (This is because the proof system is sound and complete.) In this sense, the logic can provide explanations for answers. The languages of RDF and OWL (Lite and DL) can be viewed as specialisations of predicate logic. One reason for such specialised languages to exist is that they provide a syntax that fits well with the intended use (in our case, Web languages based on tags). The other major reason is that they define reasonable subsets of logic. This is important because there is a trade-off between the expressive power and the computational complexity of certain logic: the more expressive the language, the less efficient (in the worst case) the corresponding proof systems. As previously stated, OWL Lite and OWL DL correspond roughly to description logic, a subset of predicate logic for which efficient proof systems exist. Another subset of predicate logic with efficient proof systems comprises the so-called rule systems (also known as Horn logic or definite logic programs). If A1, ... , An are known to be true, then B is also true. Rules with this interpretation are referred to as ‘deductive rules’. If the conditions A1, ... , An are true, then carry out the action B. Rules with this interpretation are referred to as ‘reactive rules’. Both approaches have important applications. The deductive approach, however, is more relevant for the purpose of retrieving and managing structured data. This is because it relates better to the possible queries that one can ask, as well as to the appropriate answers and their proofs. Rules - In DL, rules take the form of “if condition x (left side), then property y (right side)” and form statements that read as “if an object satisfies the condition on the left side, then it has the properties of the right side”. So, for example, a rule can state something like ‘all objects that are male and have at least one child are fathers’. The family of DL system consists of many members that differ mainly with respect to the constructs they provide. Not all of the constructs can be found in a single DL system. In order to achieve the goal of a broad range of shared ontologies using vocabularies with expressiveness appropriate for each domain, the Semantic Web requires a scalable high-performance storage and reasoning infrastructure. The major challenge towards building such an infrastructure is the expressivity of the underlying standards: RDF, RDFS, OWL and OWL 2. Even though RDFS can be considered a simple KR language, it is already a challenging task to implement a repository for it, which provides performance and scalability comparable to those of relational database management systems (RDBMS). Even the simplest dialect of OWL (OWL Lite) is a description logic (DL) that does not scale due to reasoning complexity. Furthermore, the semantics of OWL Lite are incompatible with that of RDF(S). OWL DLP is a non-standard dialect, offering a promising compromise between expressive power, efficient reasoning, and compatibility. It is defined as the intersection of the expressivity of OWL DL and logic programming. In fact, OWL DLP is defined as the most expressive sublanguage of OWL DL, which can be mapped to Datalog. OWL DLP is simpler than OWL Lite. The alignment of its semantics to RDFS is easier, as compared to OWL Lite and OWL DL dialects. Still, this can only be achieved through the enforcement of some additional modelling constraints and transformations. Horn logic and description logic are orthogonal (in the sense that neither of them is a subset of the other). OWL DLP is the ‘intersection’ of Horn logic and OWL; it is the Horn-definable part of OWL, or stated another way, the OWL-definable part of Horn logic. From a modeller’s perspective, there is freedom to use either OWL or rules (and associated tools and methodologies) for modelling purposes, depending on the modeller’s experience and preferences. From an implementation perspective, either description logic reasoners or deductive rule systems can be used. This feature provides extra flexibility and ensures interoperability with a variety of tools. Experience with using OWL has shown that existing ontologies frequently use very few constructs outside the DLP language. In “Combining RDF and Part of OWL with Rules: Semantics, Decidability, Complexity” ter Horst defines RDFS extensions towards rule support and describes a fragment of OWL, more expressive than DLP. He introduces the notion of R-entailment of one (target) RDF graph from another (source) RDF graph on the basis of a set of entailment rules R. R-entailment is more general than the D-entailment used by Hayes in defining the standard RDFS semantics. Each rule has a set of premises, which conjunctively define the body of the rule. The premises are ‘extended’ RDF statements, where variables can take any of the three positions. The head of the rule comprises one or more consequences, each of which is, again, an extended RDF statement. The consequences may not contain free variables, i.e., which are not used in the body of the rule. The consequences may contain blank nodes. The extension of R-entailment (as compared to D-entailment) is that it ‘operates’ on top of so-called generalised RDF graphs, where blank nodes can appear as predicates. R-entailment rules without premises are used to declare axiomatic statements. Rules without consequences are used to detect inconsistencies. Its complexity is lower than SWRL and other approaches combining DL ontologies with rules. 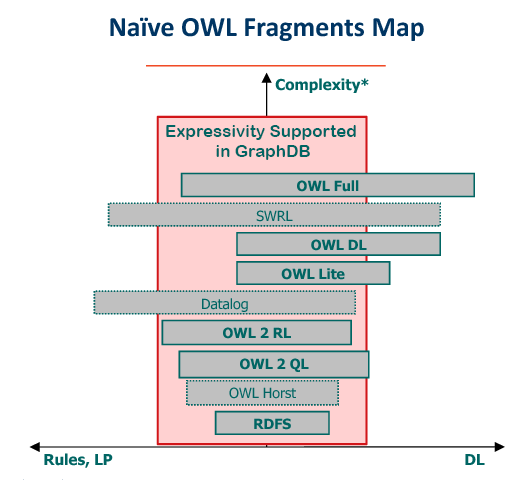 In Figure 1, the pink box represents the range of expressivity of GraphDB, i.e., including OWL DLP, OWL Horst, OWL 2 RL, most of OWL Lite. However, none of the rulesets include support for the entailment of typed literals (D-entailment). OWL Horst is close to what SWAD-Europe has intuitively described as OWL Tiny. The major difference is that OWL Tiny (like the fragment supported by GraphDB) does not support entailment over data types. OWL 2 is a re-work of the OWL language family by the OWL working group. This work includes identifying fragments of the OWL 2 language that have desirable behavior for specific applications/environments. The OWL 2 RL profile is aimed at applications that require scalable reasoning without sacrificing too much expressive power. It is designed to accommodate both OWL 2 applications that can trade the full expressivity of the language for efficiency, and RDF(S) applications that need some added expressivity from OWL 2. This is achieved by defining a syntactic subset of OWL 2, which is amenable to implementation using rule-based technologies, and presenting a partial axiomatisation of the OWL 2 RDF-Based Semantics in the form of first-order implications that can be used as the basis for such an implementation. The design of OWL 2 RL was inspired by Description Logic Programs and pD. The original OWL specification, now known as OWL 1, provides two specific subsets of OWL Full designed to be of use to implementers and language users. The OWL Lite subset was designed for easy implementation and to offer users a functional subset that provides an easy way to start using OWL. OWL Lite is a sublanguage of OWL DL that supports only a subset of the OWL language constructs. OWL Lite is particularly targeted at tool builders, who want to support OWL, but who want to start with a relatively simple basic set of language features. OWL Lite abides by the same semantic restrictions as OWL DL, allowing reasoning engines to guarantee certain desirable properties. The OWL DL (where DL stands for Description Logic) subset was designed to support the existing Description Logic business segment and to provide a language subset that has desirable computational properties for reasoning systems. OWL Full and OWL DL support the same set of OWL language constructs. Their difference lies in the restrictions on the use of some of these features and on the use of RDF features. OWL Full allows free mixing of OWL with RDF Schema and, like RDF Schema, does not enforce a strict separation of classes, properties, individuals and data values. OWL DL puts constraints on mixing with RDF and requires disjointness of classes, properties, individuals and data values. The main reason for having the OWL DL sublanguage is that tool builders have developed powerful reasoning systems that support ontologies constrained by the restrictions required for OWL DL. In this section, we introduce some query languages for RDF. This may beg the question why we need RDF-specific query languages at all instead of using an XML query language. The answer is that XML is located at a lower level of abstraction than RDF. This fact would lead to complications if we were querying RDF documents with an XML-based language. The RDF query languages explicitly capture the RDF semantics in the language itself. All the query languages discussed below have an SQL-like syntax, but there are also a few non-SQL-like languages like Versa and Adenine. The query languages supported by RDF4J (which is the Java framework within which GraphDB operates) and therefore by GraphDB, are SPARQL and SeRQL. RQL (RDF Query Language) was initially developed by the Institute of Computer Science at Heraklion, Greece, in the context of the European IST project MESMUSES.3. RQL adopts the syntax of OQL (a query language standard for object-oriented databases), and, like OQL, is defined by means of a set of core queries, a set of basic filters, and a way to build new queries through functional composition and iterators. The core queries are the basic building blocks of RQL, which give access to the RDFS-specific contents of an RDF triplestore. RQL allows queries such as Class (retrieving all classes), Property (retrieving all properties) or Employee (returning all instances of the class with name Employee). This last query, of course, also returns all instances of subclasses of Employee, as these are also instances of the class Employee by virtue of the semantics of RDFS. RDQL (RDF Data Query Language) is a query language for RDF first developed for Jena models. RDQL is an implementation of the SquishQL RDF query language, which itself is derived from rdfDB. This class of query languages regards RDF as triple data, without schema or ontology information unless explicitly included in the RDF source. Apart from RDF4J, the following systems currently provide RDQL (all these implementations are known to derive from the original grammar): Jena, RDFStore, PHP XML Classes, 3Store and RAP (RDF API for PHP). SPARQL (pronounced “sparkle”) is currently the most popular RDF query language; its name is a recursive acronym that stands for “SPARQL Protocol and RDF Query Language”. It was standardised by the RDF Data Access Working Group (DAWG) of the World Wide Web Consortium, and is now considered a key Semantic Web technology. On 15 January 2008, SPARQL became an official W3C Recommendation. SPARQL allows for a query to consist of triple patterns, conjunctions, disjunctions, and optional patterns. Several SPARQL implementations for multiple programming languages exist at present. to start from the known facts (the explicit statements) and to perform inference in a deductive fashion. Forward-chaining involves applying the inference rules to the known facts (explicit statements) to generate new facts. The rules can then be re-applied to the combination of original facts and inferred facts to produce more new facts. The process is iterative and continues until no new facts can be generated. The goals of such reasoning can have diverse objectives, e.g., to compute the inferred closure, to answer a particular query, to infer a particular sort of knowledge (e.g., the class taxonomy), etc. Advantages: When all inferences have been computed query answering can proceed extremely quickly. Disadvantages: Initialisation costs (inference computed at load time) and space/memory usage (especially when the number of inferred facts is very large). involves starting with a fact to be proved or a query to be answered. Typically, the reasoner examines the knowledge base to see if the fact to be proved is present and if not it examines the ruleset to see which rules could be used to prove it. For the latter case, a check is made to see what other ‘supporting’ facts would need to be present to ‘fire’ these rules. The reasoner searches for proofs of each of these ‘supporting’ facts in the same way and iteratively maps out a search tree. The process terminates when either all of the leaves of the tree have proofs or no new candidate solutions can be found. Query processing is similar, but only stops when all search paths have been explored. The purpose in query answering is to find not just one but all possible substitutions in the query expression. Advantages: There are no inferencing costs at start-up and minimal space requirements. Disadvantages: Inference must be done each and every time a query is answered and for complex search graphs this can be computationally expensive and slow. As both strategies have advantages and disadvantages, attempts to overcome their weak points have led to the development of various hybrid strategies (involving partial forward- and backward-chaining), which have proven efficient in many contexts. Imagine a repository that performs total forward-chaining, i.e., it tries to make sure that after each update to the KB, the inferred closure is computed and made available for query evaluation or retrieval. This strategy is generally known as materialisation. In order to avoid ambiguity with various partial materialisation approaches, let us call such an inference strategy, taken together with the monotonic entailment. When new explicit facts (statements) are added to a KB (repository), new implicit facts will likely be inferred. Under a monotonic logic, adding new explicit statements will never cause previously inferred statements to be retracted. In other words, the addition of new facts can only monotonically extend the inferred closure. Assumption, total materialisation. Query and retrieval are fast, because no deduction, satisfiability checking, or other sorts of reasoning are required. The evaluation of queries becomes computationally comparable to the same task for relation database management systems (RDBMS). Probably the most important advantage of the inductive systems, based on total materialisation, is that they can easily benefit from RDBMS-like query optimisation techniques, as long as all the data is available at query time. The latter makes it possible for the query evaluation engine to use statistics and other means in order to make ‘educated’ guesses about the ‘cost’ and the ‘selectivity’ of a particular constraint. These optimisations are much more complex in the case of deductive query evaluation. Total materialisation is adopted as the reasoning strategy in a number of popular Semantic Web repositories, including some of the standard configurations of RDF4J and Jena. Based on publicly available evaluation data, it is also the only strategy that allows scalable reasoning in the range of a billion of triples; such results are published by BBN (for DAML DB) and ORACLE (for RDF support in ORACLE 11g). Over the last decade, the Semantic Web has emerged as an area where semantic repositories became as important as HTTP servers are today. This perspective boosted the development, under W3C driven community processes, of a number of robust metadata and ontology standards. These standards play the role, which SQL had for the development and spread of the relational DBMS. Although designed for the Semantic Web, these standards face increasing acceptance in areas such as Enterprise Application Integration and Life Sciences. In this document, the term ‘semantic repository’ is used to refer to a system for storage, querying, and management of structured data with respect to ontologies. At present, there is no single well-established term for such engines. Weak synonyms are: reasoner, ontology server, metastore, semantic/triple/RDF store, database, repository, knowledge base. The different wording usually reflects a somewhat different approach to implementation, performance, intended application, etc. Introducing the term ‘semantic repository’ is an attempt to convey the core functionality offered by most of these tools. Semantic repositories can be used as a replacement for database management systems (DBMS), offering easier integration of diverse data and more analytical power. In a nutshell, a semantic repository can dynamically interpret metadata schemata and ontologies, which define the structure and the semantics related to the data and the queries. Compared to the approach taken in a relational DBMS, this allows for easier changing and combining of data schemata and automated interpretation of the data.